Sunday evening after arriving in Speyer and checking into my room, I had some time to try and digest my whirlwind days in Switzerland before shrugging out of my Kubler Coat of Arms and into the one for my Metz family. Monday morning I took a bus to the train station, and then three trains to Insheim. I was met at the train station by Roland, our translator, and also Herbert and Bernhard. They drove me to the Rathaus, which is like our city hall, where I met with the mayor and a couple of other people. After some champagne and fresh rolls, they showed a slide presentation of some of the information they had collected about my Metz family. They also provided the data in a printed notebook, in English, which is awesome. Following the presentation we went upstairs to the Glocken Museum, the second largest collection of bells in Germany. This collection was donated by a resident, and the town takes care of it. Next we took a walking tour of the town, where they pointed out the historic buildings. We saw the Catholic Church, but as this one was built in 1912 and completed in 1914, it is not the one my ancestors would have worshiped in. In Germany, the ruling king determined what religion the people practiced. So a church may have been Catholic for one reign and then protestant for the next. When that was no longer a law, then churches would sometimes allow both religions to use their building. 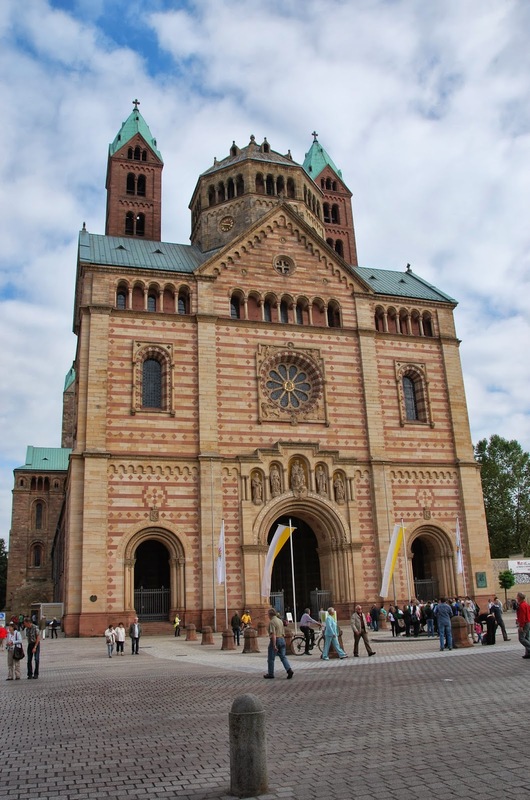 That was the case in Insheim until the Catholics began building their own church in 1912. Here is the old church where the Metz family would have attended services. It is now Lutheran. The town cemetery is located next to the Lutheran Church. I took pictures of all the Metz graves that I could find. In Germany, and the same is true in Switzerland, the family rents the grave space for a maximum of 30 years. When someone stops paying or the 30 years is up, the tombstone is removed and someone else is buried there. I asked what happens to the tombstones, and was told that the family could take the stone or it would be ground up and reused. Talk about reduce, reuse, recycle! Next we drove to Burg Landeck, a nature park containing a castle. There were beautiful views especially from the tower of the castle. We also had lunch at the castle restaurant. Next on the agenda was a trip to Steinweiler, a small village located near Insheim. Maria Appollonia Schwein from Steinweiler married Andreas Metz from Insheim in 1777. In Steinweiler the local historians had located the house of the Schwein family from 1717. How did they know which house was theirs? It is etched right onto the house. When I saw these markings all I could think was how happy Americans would be to find out not only when the house was built but for whom, just by looking at the outside of the house. The markings also indicate that Schwein was a blacksmith. While we were taking photos of the front of the house the owner came home from work. When Roland explained that I was visiting from America and that my Schwein family had lived here, he invited us inside the courtyard and the kitchen area. He and his wife are having the house renovated, and the workmen were there at the time so we couldn't see more of the house itself. To say that it was a thrill to be able to cross the same threshold that my ancestors had crossed is a vast understatement. I still have goosebumps! On the way back to Insheim we stopped at a vineyard as Roland explained to me that this part of Germany is often referred to as Little Tuscany. I can definitely see why. It is a beautiful area. Once we arrived back at the Rathaus I was invited to sign the Golden Book, an honor reserved for VIPs. I was flattered to be asked, and how fun to know that I have left a permanent part of myself in the town that my ancestors once called home. Then Roland and Herbert offered to drive me back to Speyer so I could avoid the three train rides and bus transfer to get back to my hotel. Since they had given me two commemorative glasses of town celebrations as well as two historical books, I was happy to take them up on their kind offer. This was another information packed day with yet another group of people who put a lot of time into looking for my family history, and making me feel welcome in their town. I feel so blessed that my family came from this wonderful little village. On Saturday, September 21st Rolf and his wife Andrea picked me up at 9:45 so that we could tour the tower of the Catholic Church in Busserach. The tower itself is the only piece of the church remaining from when my ancestors worshiped there as this is the third church building. Somehow the tower, circa 1464, survived the fires and other disasters that felled the previous two churches. Within the tower is a museum of artifacts that had been housed in the basement of the church until water damaged them. They are now on display in the museum. I was able to see the old basin that was used to baptize the parishioners, including my Kublers. We were able to climb the narrow, steep steps leading up to the bell tower tower. It was amazing to see the bells that close, but I kept thinking that here in the states no one would let anyone climb the tower due to liability. How refreshing that it does not seem to be an issue in Switzerland. Following the tour of the church and the tower we celebrated with some wine and crackers. Then it was time for the main event, the Kubler family gathering at Neu-Thierstein Castle, located just outside of the town. The castle I believe is from the 1100s, and it had fallen into ruin. In the 1800s efforts were made to stop the dismantling that had been taking place. In recent years the village of Busserach bought the castle and has done restoration work, including adding a clear roof so that the castle can be used for events year-round. Once the family members started arriving, we gathered in one of the rooms on the upper level where we would be able to not only eat but also watch the slide presentation that Rolf had put together about my family. It was interesting to me that a number of the attendees had to introduce themselves to each other. I guess I just assumed that in a town the size of Busserach (around 2,000 people), everyone would know one another. The food was good, and the slide show was very informative. I think the best part of it was that it got so much conversation started among the relatives. It was fun to hear the excited conversations, even if I didn't understand what was being said. We gathered up the email addresses of those who wished to contribute theirs, so I am hoping that we can somehow stay in touch despite the language barrier. I have very few Kubler relatives in the Unites States. Maybe I will end up with more in Switzerland. The day ended with dinner at Rolf's house with his wife and two sons. We had cheese fondue, and it was very tasty. I think we do a pretty good job with fondue over here, but I have to say that their cheese is so much better. And it will be hard to ever top having it with a Swiss family in Switzerland. The next morning Rolf picked me up at 9:00 so that we could drive to a high point for me to take some pictures of the village from up above. Unfortunately the morning was too foggy to do that, but we went to some land owned by a Kubler family and I got some interesting pictures there. 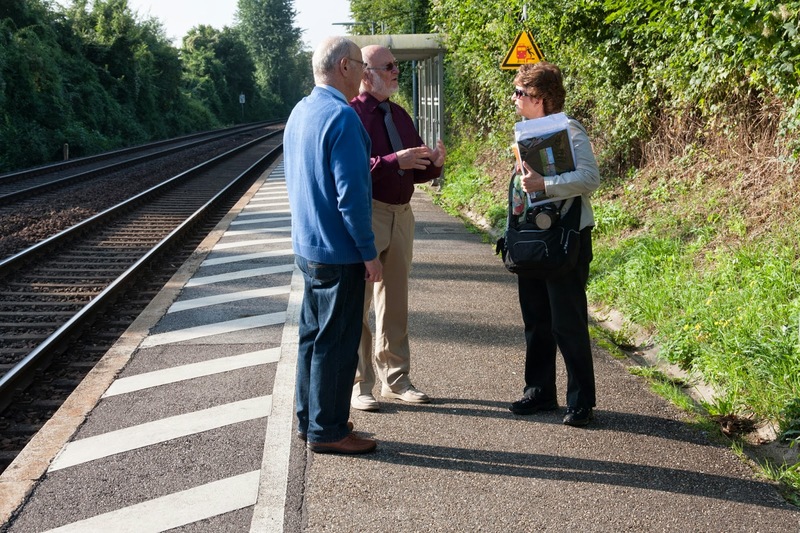 We then spent a little more time at his house while he burned some CDs for me, and I had an opportunity to say good-bye to his family before he took me to the Laufen station. From there I took several trains to Speyer, Germany where I met back up with my tour group. What an unbelievable experience, and I have no idea how to thank the person that made it all possible.